Why Should You Consider Probe Lockers? What’s the Benefit with Buying a Probe Locker? Probe Lockers are a high quality brand of lockers in the UK, which also serves schools, police departments, hospitals and hotels around the world. But what makes them so good? There are several different types of Probe lockers for different locations. There are unique lockers for schools, post offices, fire stations and many other places. Their quality key locking design helps them keep your belongings safe. The anti-bacterial powder coating protects you from the spread of diseases. Different venues often require specific features and functions when it comes to lockers. A school requires a simple space efficient locker with a sturdy lock. Students must be able to store large text books and keep items safe from opportunistic theft or accidental harm. However, other places might need lockers with a more sophisticated function. A post office or an apartment building would need a post box locker with a slot for easy deposits. There are even laptop lockers that have charging outlets inside them, which is excellent in an increasingly connected world. With variety like this, Probe is able to offer a product for many different needs. Probe locker offer excellent key locking designs that are either built into the locker or they facilitate the use of a pad lock. Lockers like this Probe Key Lock have the lock built into the door which makes it more difficult to tamper with or break the lock. The pad lock design doesn’t make it any easier, however. It uses a hasp and staple lock which the padlock’s shackle slips through. The protruding metal hasp protects the padlock, making more difficult to cut or destroy. Germs and diseases tend to spread through schools and workplaces like wildfire. With so many people working closely with one another, a cold can start with one person and go through everyone by the end of a month. However, many Probe lockers come with a germ resistance powder coating that helps cut down on the spread of diseases. With you and your belongings coming into contact with so many surfaces throughout the day, you need all the anti-bacterial help you can get! 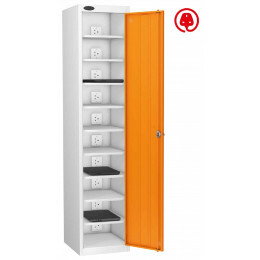 With so many innovative features, it is no wonder that Probe is such a quality brand of lockers. From securing your belongings to securing your body from germs Probe offers you many benefits. Why Would a School Need a Post Locker? How Much Does a Typical Wet Area Locker Store?